It’s time to start thinking about getting your boat out of storage and putting it where it belongs – in the water! But how will you get it there? AAA has several handy tips to keep you, your boat and other people on the road safe. As the summer is also a popular time to move, these tips can also apply to hitching a trailer to your car to cart your stuff from your old home to your new home. Before you do anything, check your vehicle’s weight, which is listed on the driver’s door decal, and its towing capacity, which is the combined weight of a trailer and load. The latter is found on the dash plate with the VIN or in the owner’s manual. This will help you decide how much weight you can safely tow, even if a manufacturer’s specification says it’s okay to pull something that weighs more than your vehicle. Keep in mind, the heavier the load, the harder it is to control, so think hard about what you can realistically haul and what you can’t. Most cars these days won’t allow you to put a temporary hitch on your bumper. If you find yourself in need of one, you can go to a trailer-rental business and have them install one that will cost $185-$250 depending on your vehicle. Before you leave after getting a hitch installed, check to make sure the pin securing the ball mount to the receiver is intact, the hitch coupler is secured and the hitch safety chains and the electrical plugs for the trailer lights have been properly installed. As how the trailer is loaded will affect your ability to control your car, AAA recommends placing the heaviest items in the front of the trailer and distributing the weight evenly form side to side. Remember to secure the items in the trailer so they don’t move around during the drive and make sure your trailer is level. If you are towing a trailer or boat, give yourself extra time and space to avoid obstacles and give yourself plenty of time to stop your car in a safe manner. It’s also best if you avoid sudden stops and starts, avoid quick steering maneuvers and make extra-wide turns. When backing up, turn the steering wheel in the opposite direction you want the trailer to go. To assist you with this tricky maneuver, place your hand at the bottom of the steering wheel and the trailer will move in the same direction as your hand. It’s probably best to practice in an empty parking lot before doing it with other cars and people around. 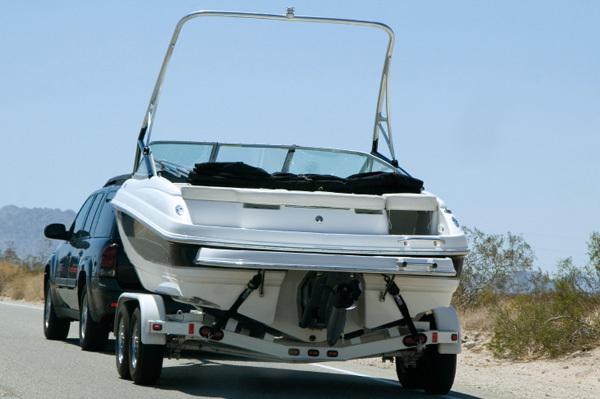 If your trailer or boat starts to sway, take your foot off the accelerator slowly and gradually apply the brake after you’ve begun to slow down. If the trailer has electric trailer brakes, apply the trailer brakes gently to help stop any swaying. Once you’ve come to a stop, check the trailer and reposition your belongings if things have shifted. If the wind is making your trailer or boat sway, simply slow down.